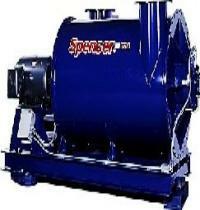 The Spencer Turbine Co., since 1892, Spencer has developed vast technical capabilities in low to high pressure blowers. The se blowers operate in demanding applications such as continuous-duty chemical processing and wastewater treatment. In addition to a wide selection of blowers fabricated of materials to meet customer specifications and demanding environments, there is a separate series of Power Mizer® blowers with cast iron casings and cast aluminum impellers, which incorporate new concepts in high efficiency blower design. Spencer blowers range in size from fractional horsepower Vortex® Regenerative blowers all the way up to 2000 HP Power Mizer blowers. Spencer also has extensive design expertise in heavy-duty vacuum systems, including central vacuum systems and mobile vacuum systems with broad industrial, and commercial applications.